Chicke udon noodle recipe | Everything Delicious. Udon noodles are definitely the most comforting Japanese noodles. The kind you can’t eat everyday but really crave once in a while. Yesterday was one of these days and so I had to answer the udon noodles’ calling. I don’t really know many places where you can have good ones in Montreal (if you do, let me know) so I decided to try home made ones. And the result was a pretty yummy udon noodle recipe! So here is sharing the secret, keep it handy for any future udon cravings. Prepare your udon noodles according to the package instructions (usually 1 min in boiling water if you stir fry them afterwards). Set aside. Heat the olive oil and sesame seed oil in a wok and add chicken pieces. Cook for about 10 min. Add the soy sauce, hoisin sauce, and chicken broth, stir and bring to a boil. Taste and add black pepper or chili flakes to spice things up. Add udon noodles and cook until noodles are heated through. Garnish with green onions, serve and enjoy. 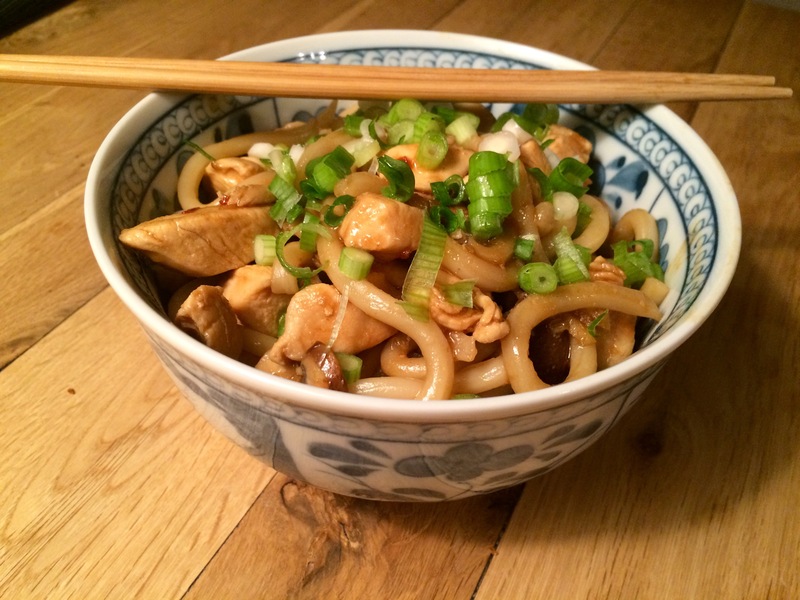 This entry was posted on October 23, 2016 by Pauline Rosen in Recipe feed and tagged chicken, hoisin sauce, japanese food, soy sauce, stir fry, udon, udon noodle recipe, udon noodles, udon recipe.